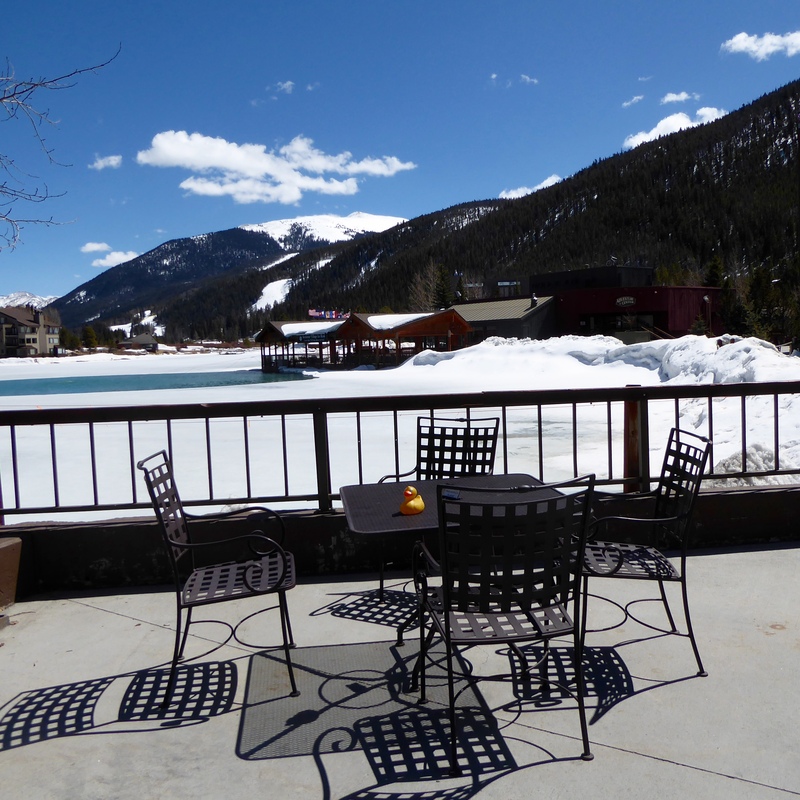 You probably know that we have had a lot of spring snow in the Colorado Rocky Mountains. I, Zeb the Duck, knew it, but I wanted to see it. 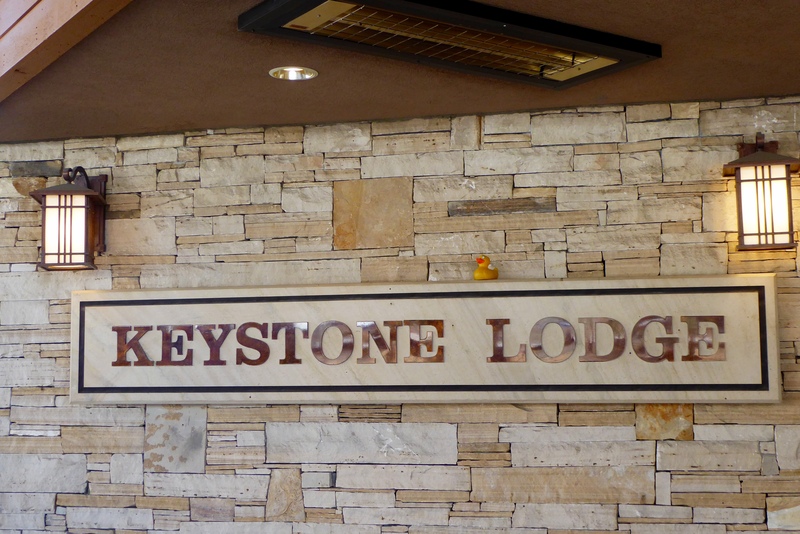 We drove west on I-70, through the Eisenhower Tunnel and then went to Keystone Resort. Parking in the lot across the road from the resort, we saw this building marking the entrance to the pedestrian tunnel. We walked inside and these are the stairs to descend into the tunnel. 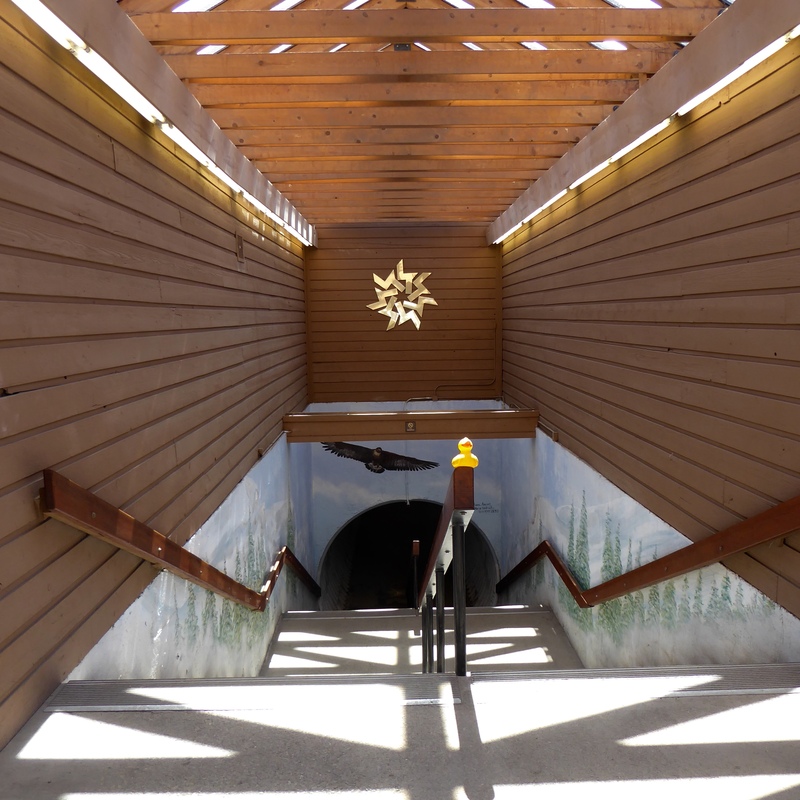 And, inside the tunnel, it looked like a sunny mountain day. I like this tunnel. It is cheery and bright. Up the stairs at the end of the tunnel, we entered Keystone Lodge. Lodges are nice, but it was sunny and fairly warm, so let’s stay outside. Down some more stairs and we were at the lake. 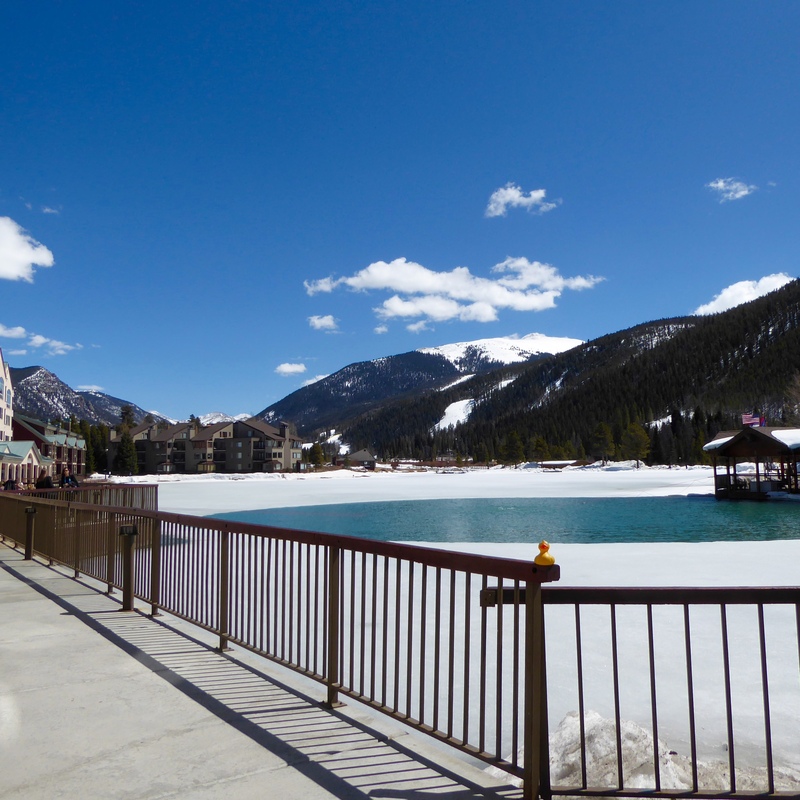 This 5 acre lake was not frozen deep enough, but when it is, this is Keystone Village Ice Rink and it is 9,321 feet above sea level. We were not hungry, but there are restaurants here and this is our favorite table by the lake. Maybe next time for lunch. They do have really good food here. 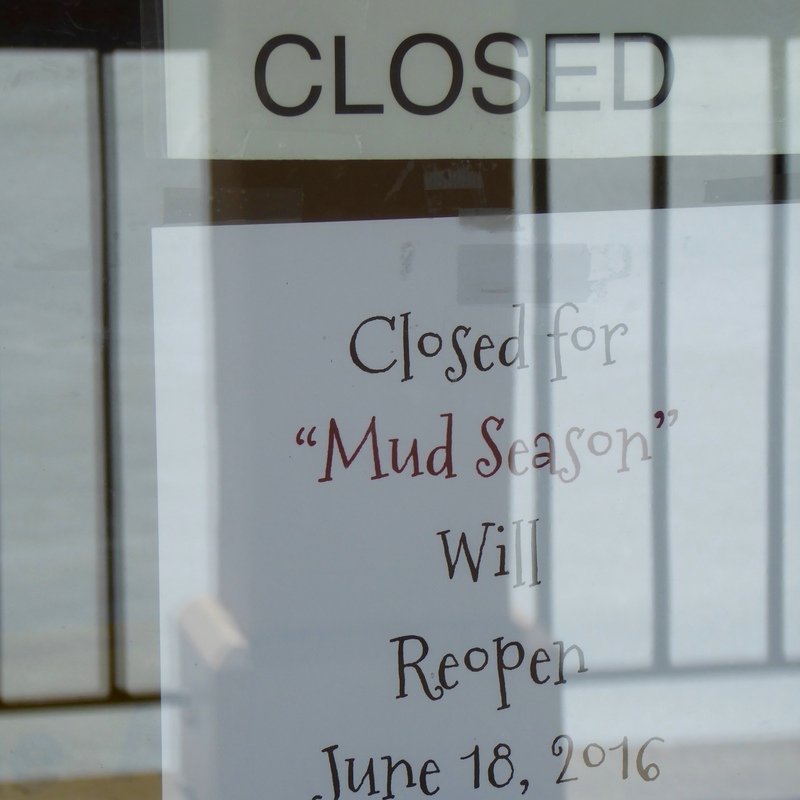 This store was closed…for “mud season”. What is mud season? Oh, now I get it. Mud season. The spring sun is so intense things melt during the day, and at over 9,000 feet elevation, everything freezes at night. We went to this ski lift. 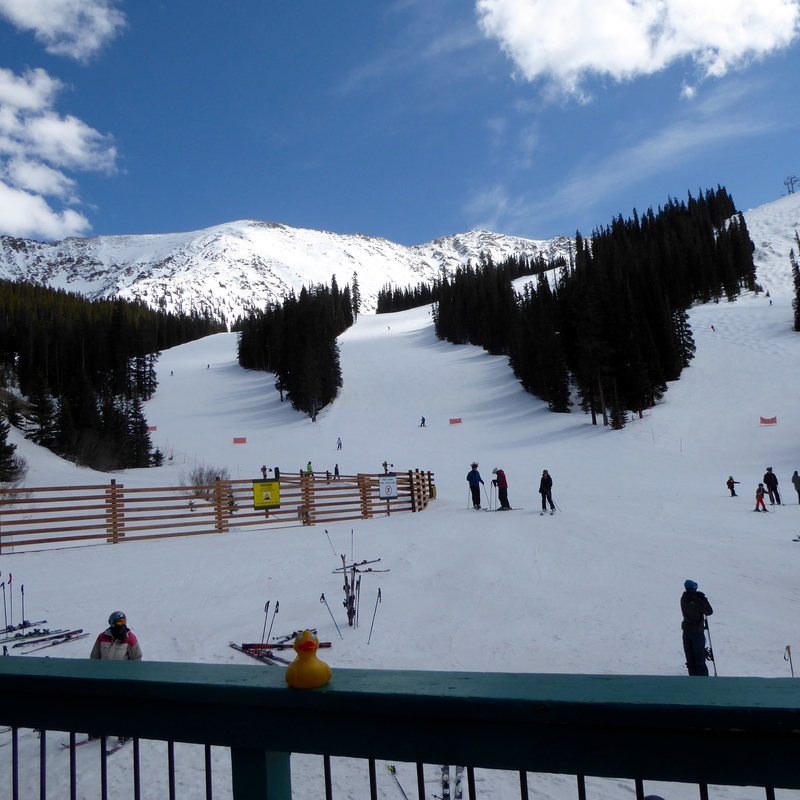 I, Zeb the Duck, decided not to ski. This is too high and too steep for a small duck. These humans are riding on a chair lift, going to the top of the mountain. And, if they go up, they must come down. Sometimes skiing under the chair lift. Here they are at the end of the run. You can see that it is not very crowded today. We come to the mountains during the week to avoid crowds. This is one of the best sights to see on the highways. This is a run away truck ramp. 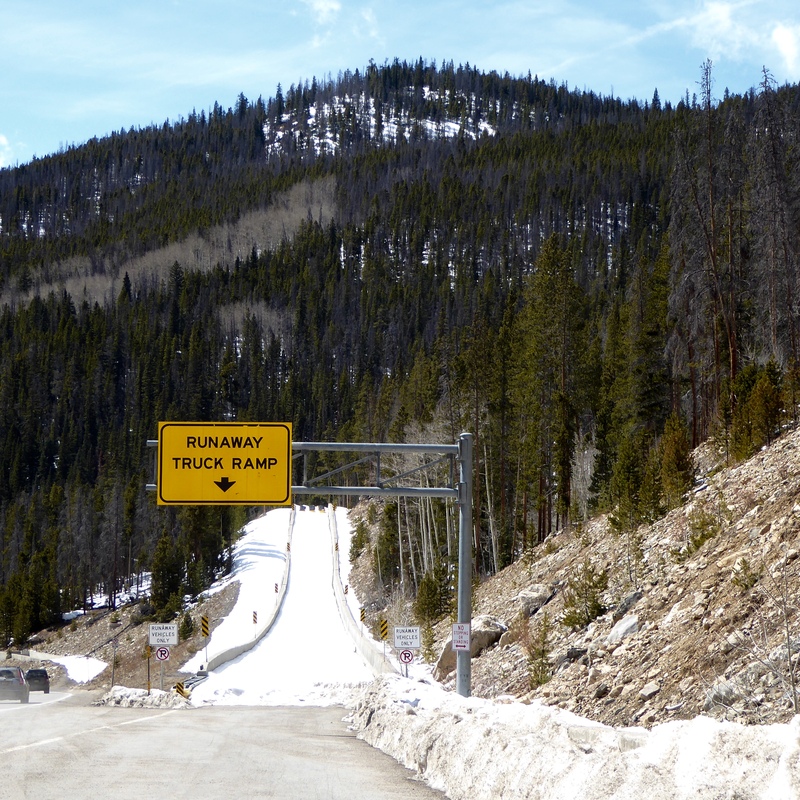 The trucks come down steep grades and can burn out their brakes. If that happens, they enter a run away truck ramp, going up hill with a foot or two of loose sand to slow them down. We like this one because we can see from the snow that it has not been used. That is good that nobody had a problem. 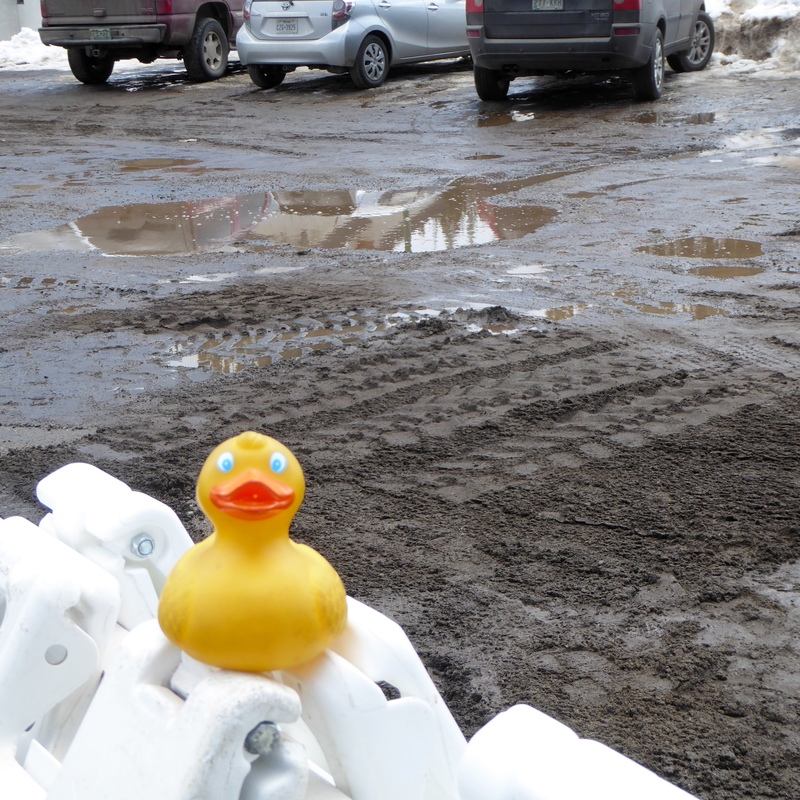 I, Zeb the Duck, liked the spring snow in the mountains. It was really warm when the sun was shining but rather cool when clouds came. We really like Colorado. 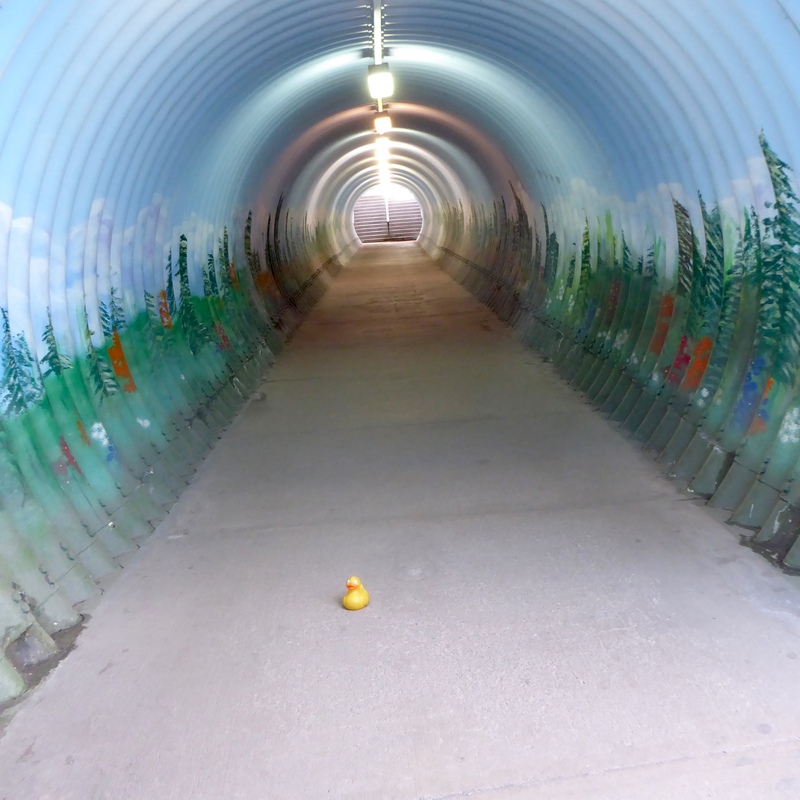 This entry was posted in Colorado, Uncategorized and tagged Colorado, Colorado Traveling Ducks, Keystone Lodge, mud season, pedestrian tunnel, run away truck ramp, spring skiing. Bookmark the permalink. 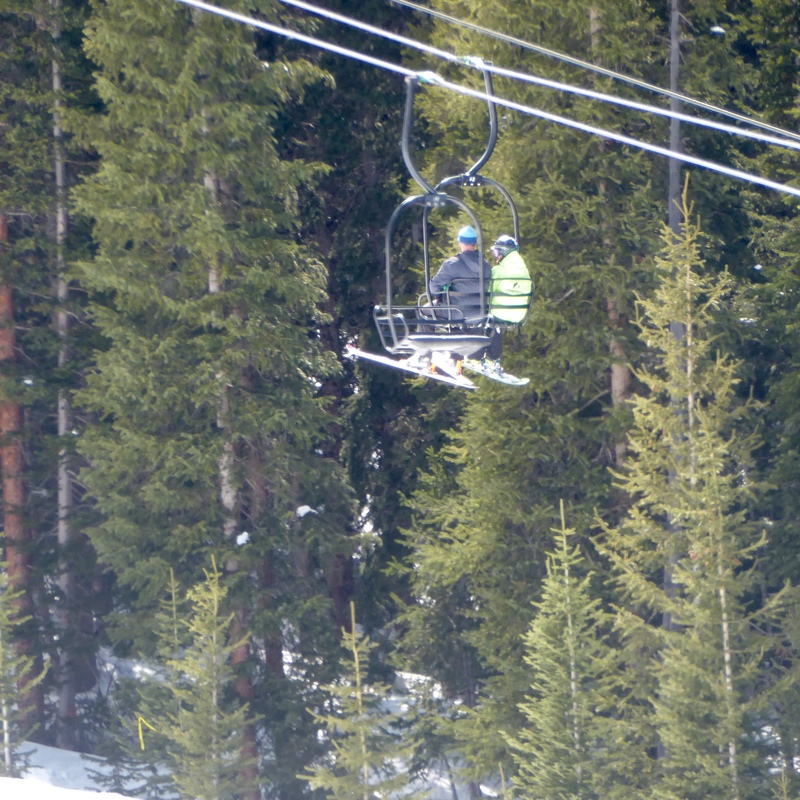 I love riding on chairlifts. Can you go back down that way too? Unfortunately no. During ski season, you ride up and only come down on skis or snowboards. 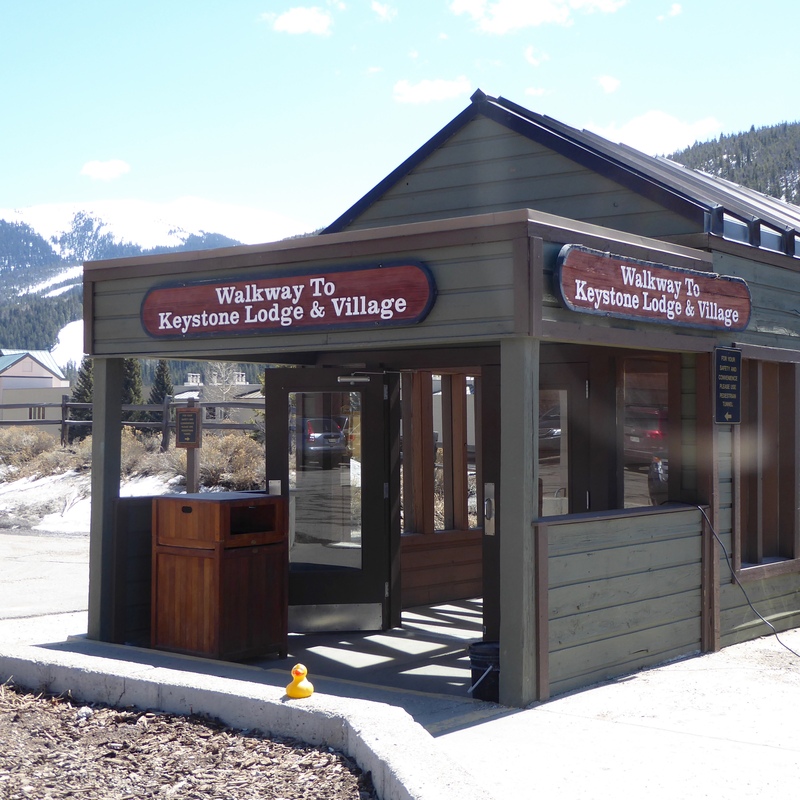 But, in the summer most major resorts have at least one lift going to the top with restaurant or snack stop and hiking trails up there. 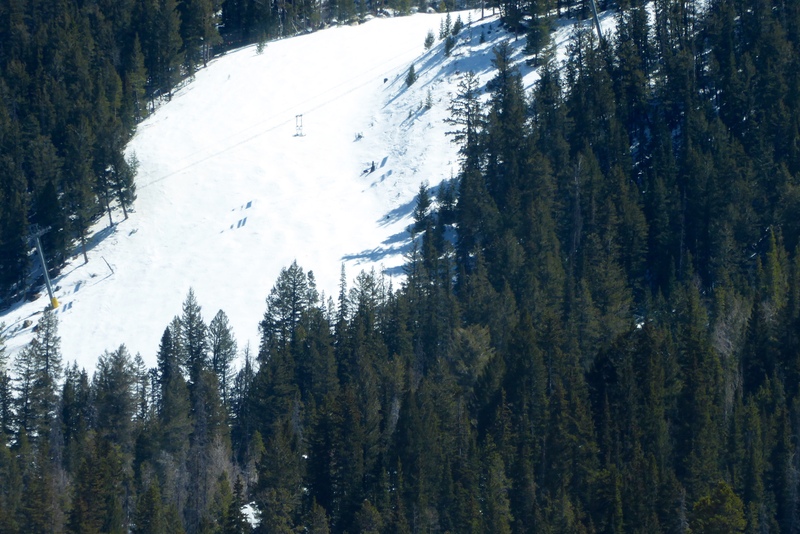 Some use chairlifts, some use gondolas (enclosed cars) and some have both running. 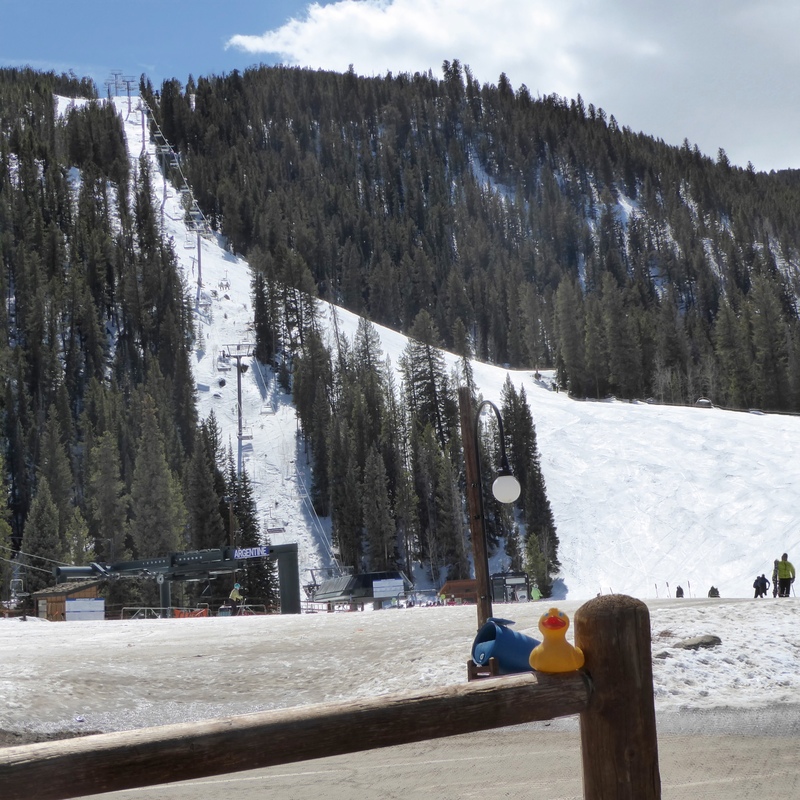 Some resorts have alpine slide, which is a half pipe coming down the ski run and people ride sleds on the half pipe. Is also a lot of fun and a good way to get down the mountain. You can either ride mountain bikes down, hike down or ride chairlift back down. We usually ride up, have a snack, hike around and ride down. Or, if available, often ride alpine slide down. It is beautiful in the summer on the mountains. Thanks for reading and commenting. The half pipe sounds like fun. It is a wonderful place. Thanks for reading and commenting. The Alpine slide–the half pipe is a lot of fun. One of my favorite summer mountain activities.